Now and then, we hear about the strict laws against illegal streaming of content via Kodi. But are these actions effective? The viewers are using Android box Kodi and such other tools to stream the content of their choice. The UK’s biggest internet service providers (ISPs) like BT, Virgin Media, and Sky, have strict directions from the government to take stringent action against those involved in the illegal streams. Whatever is the case, the illegal streaming through Kodi add-ons is a significant concern for copyright holders as well as the authorities. What Is The Android Box Kodi? Android box Kodi is one of the applications that helps stream content via Kodi. With the help of Android box Kodi, your list of choices for online programs grows exponentially. This streaming app can run on all of your computer devices seamlessly, delivering connectivity on the go. There are over a million people in the UK who use Android box Kodi, and you could also call this a kind of set-top box for your television. In essence, it is an HDMI stick which harbors the Kodi software. Kodi was earlier called XBMC, and it is free software that is used for playing videos, music, or games. You have the advantage of all your media in one place, ready for playing on any device. Kodi works equally well on television, computers, mobiles or tablets. Any show can be streamed from the internet to be watched on numerous platforms. Kodi boxes modified with third-party plugins can also access paid content channels for premium shows without paying. This has opened up a plethora of possibilities. Kodi boxes are entirely legal in the UK. That is until they are used in a manner that makes subscription channels unlocked. That is a grey area and you should use it with care. Also, a VPN service helps you unblock Kodi. Beaming action from the group stages and the knockout stages of the Champion’s League, made it the go-to solution for many. This exciting tournament featuring the best football clubs in the world was previously only accessible for those with metered connections. And they had to pay a hefty amount for subscriptions. Therefore, viewers opt for Kodi add-ons, which offer sports streaming. However, you should always stream the content which does not infringe copyright, and is legally accessible. On a broader perspective, some nations have imposed a ban on Kodi altogether. So, if you are looking to unblock Kodi, use a VPN online. Le VPN is compatible with the Android box Kodi, and it makes your Kodi experience more productive and safer. Le VPN has top quality VPN servers in over 114 countries. And its HybridVPN takes care of TV streaming from the foreign nations. 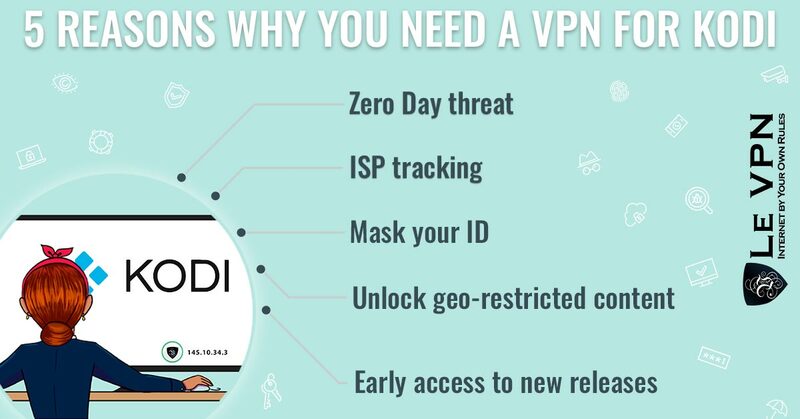 When you use HybridVPN, you will benefit from encryption along with a SmartDNS system to hide your IP addresses. As a result, you enjoy seamless TV streaming anonymously, that too from anywhere. If you have not tried Kodi Android box, it’s time to buy one. For the superior streaming experience, subscribe to Le VPN.